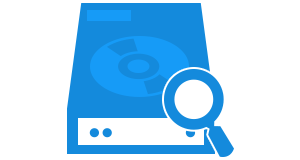 Free Disk Image viewer utility provides facility to open and view all types of disk image files with an ease. It supports DD, DMG, and E01 disk image files to be explored with help of this freeware. One is free to view entire content of the source file without any platform dependency issues. Disk Image reader is designed with such advance algorithms that it is capable of regaining data from browsed file, which was lost due to one or the another reason. Software will load and display the retrieved data for viewing whole content of the source disk image file. An advance feature of the Disk Image reader is its date-filtering option. 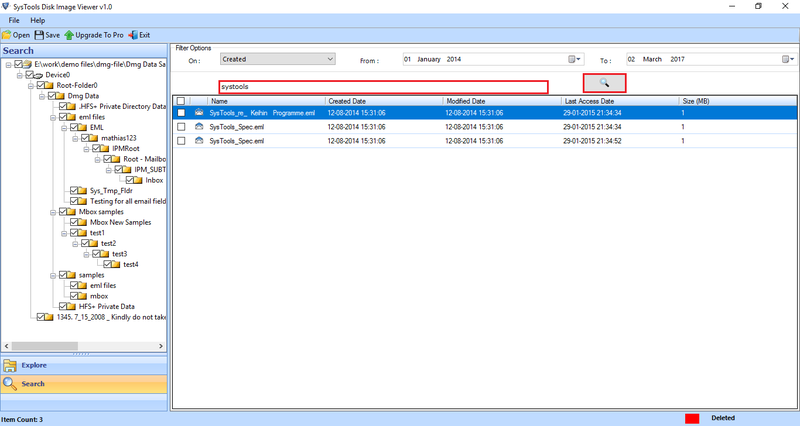 This enables users to perform filtering inside the DMG/DD/E01 file. 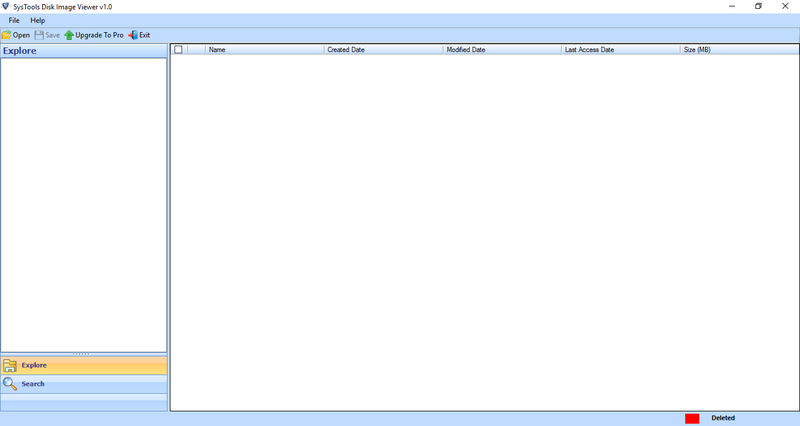 The filtering scenario is based upon the certain criteria i.e., File Creation Date, Modified, and Last Access Date. One is free to filter items within the disk image file. Disk Image opener have came up with an exiting feature of searching a particular file from the displaying screen. Instead of viewing entire file content, users can view only the desired item by mentioning file name or any other attribute related to the searching file. The Disk Image file reader provides an additional option to preview properties of a particular item like image, email, etc. One just need to right-click on the item, click on Preview option, and then software will automatically load a Preview window in which users will be able to learn file properties. 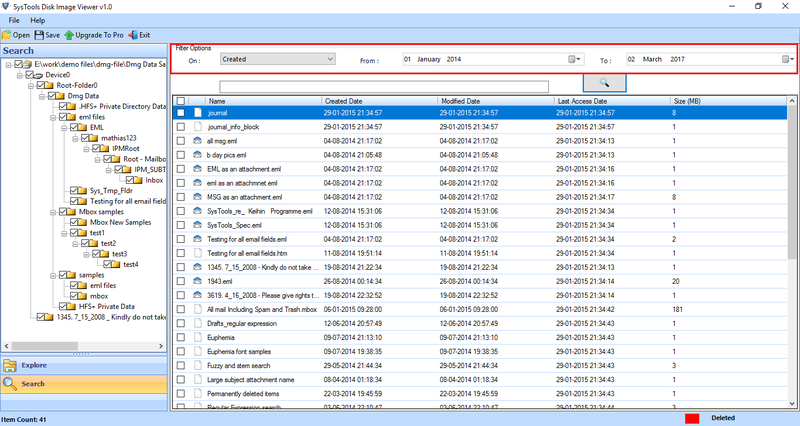 Disk Image Viewer for free program loads folders and sub-folder in a well-structured format. A tree-based structure is displayed on left-hand of the software panel where users have to click on the targeted folder. Moreover, the viewer is having a simplified interface due to which it is possible for novice users also to read Disk image file. Is your Disk Image reader program compatible with Windows 8.1 operating system? 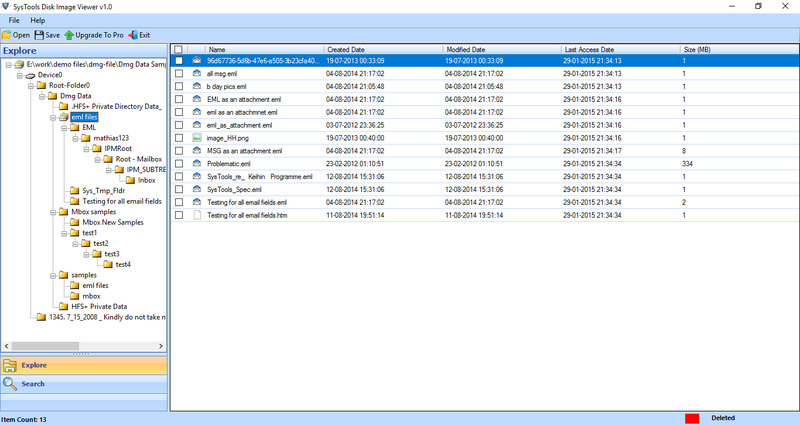 Yes, our software is Windows-based, which opens and extract disk image file on all versions of Windows, including 10. Among all other applications, what makes your software unique? 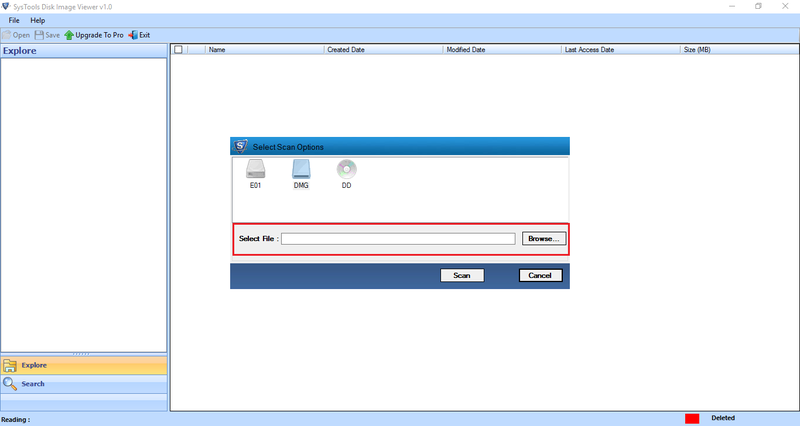 The application is providing facility to view all types of disk image files (DD, DMG, and E01) at one place for free. Moreover, Disk Image reader is providing advance filtering and searching option to view disk image file on your computer. I am having a disk image file of 4.55 GB and wants to view its data with help of your freeware. Is it possible to view disk image file of such size with help of your utility? Yes, our Disk image viewer is not restricted with disk image file size. You can browse disk image file of any size with help of this utility. Is your Disk Image file reader completely free of cost? Does it require any additional payment for recovering deleted data from the source disk image file? Yes, the tool is completely free of cost. It does not require any payment for retrieving data from the source disk image file therefore, you can explore disk image file without any hassle with help of this tool. Will it be possible to regain deleted disk image on Windows with help of this Disk Image file viewer? Yes, disk image opener enables users to restore the deleted data from added file. Now all your data is loaded and displayed on the viewer screen where you can have a look on complete content of the source file along with their properties. "I was having an E01 disk image file with me, which was having OST and PST files within it. Since I was trying to open this file after a very long time therefore, I forgot the exact procedure to explore this file, causing a major issue for me and my team. One of my teammate recommended me to use this application I took his suggestion and used this Disk Image reader. It was so easy for me to open the file that now I don’t even need to remember any technical process to read file. Thanks to the team!" 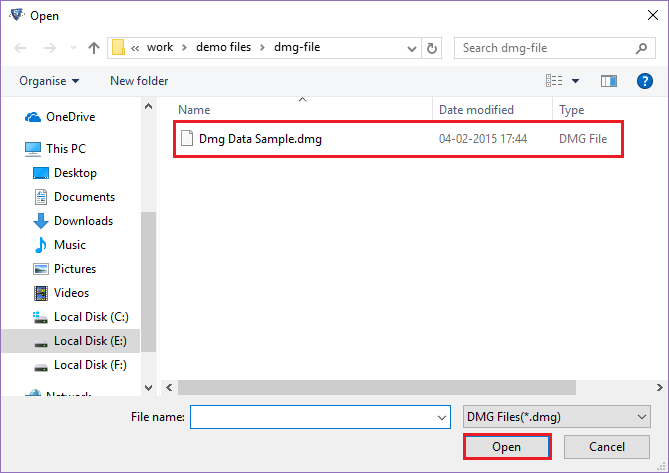 "I have used Disk Image file viewer to open my DD file on Windows 10. It was a great experience for me while working with this application. Performance speed of scanning the file is fastest from all other applications, which I had being using till now. The surprising part about this software is that being a freeware, it recovers deleted data files. Seriously, Disk image file reader is the best product to view all types of disk image files on Windows platform."